If you follow my blog you will know that late last year I bought a house and land package in sunny Bay of Plenty. Although it was a package deal, this is no ordinary home and no ordinary builder. Aaron and his wife are the design duo behind Paradise homes and The Gourmet Kitchen Company and between them they add finesse to their homes that definitely make them stand out. Just over a week ago we went down to see the progress of the house and to discuss the landscaping details with Aaron. The kitchen had arrived although still tightly wrapped up Aaron tore away the packaging so we could take a sneak peek at the pantry (above) and one of the bathroom cabinets. 3. Above: Kitchen cabinetry - Resene Quarter Thorndon Cream. This is one of the small cabinets that goes either side of the range hood canopy. I love the little cross detail which will work with the adjacent barn sliding door, see earlier post. The timber floors are down and look fantastic and the bathroom tiles are also down but I don't have a high res image of these, I will take some next time I go down. I had a bit of a dilemma over the bathroom tiles as I sent an image of a shower to Sarah (see image 5) and asked her if it was possible to have a similar look. 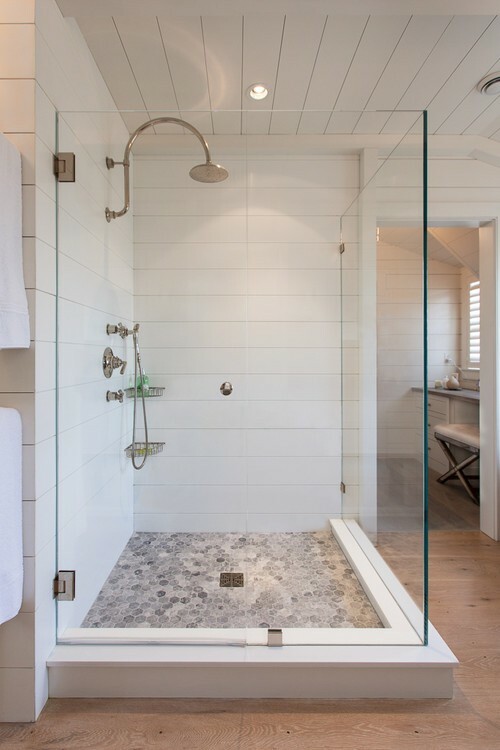 Sarah loved this idea and has similar in her beach house, however she said the Cararra really works better against a black stone tiled floor rather than off white. Eeek! I thought, black is not a colour I would normally choose, however Sarah was convincing and she does have plenty of experience in building so I said "ok". Both bathrooms will have the first tile you can see below, the dark floors will make everything white, really pop! Above: The fireplace is in progress and Sarah has added what she termed "eyebrows", above the windows either side. I love that term, they frame the window, so its the perfect word, so much nicer than "architrave"
With regards to the exterior we had to make a decision about the outdoor lighting. I was originally going to have black iron carriage style lights but Sarah found these pretty lights and I decided that they were too nice not to use plus as she said, it is a softer look which is probably where the house is going with its exterior. Again, I didn't take my good camera with me so you will have to forgive the poor quality of the photos but hopefully you will get the gist of the progress so far. Aaron is sending me a landscaping plan so once he does I will share those ideas. I have a few images of the fireplace since these were taken but they are not large images, I will share these next week. All is on track for completion mid April and I cannot wait to go down again in a few weeks time and see the progress. Hi Lee I didn't realise u had bought down there. How exciting. love the cupboards and the tiles and the flooring LOL. Can't wait to see more. Hi Jane, thanks for dropping by :), yes bought a land and house package last October it should be finished soon, I can't wait to go down in a couple of weeks and take more photos, the kitchen should be complete by then and the fireplace which I am sure you will love. Posting more on the fireplace next week.